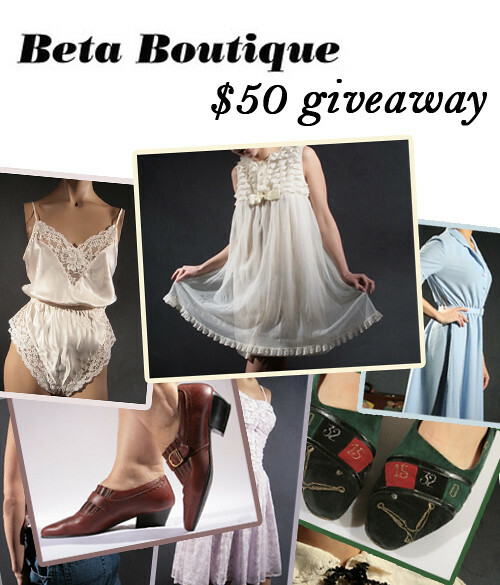 The lovely Beta of Beta Boutique and I have put together another little giveaway for you guys! We'll be giving away $50 of storecredit to one of you lovely readers. Awesome! I already picked out some of my favorites from the shop. The giveaway is open for everyone and you can enter until the 15th of July. -Make sure you're following The World Looks Red on Google Friend Connect or Bloglovin'. 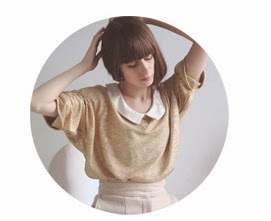 -Follow Beta's blog Vintage Beta. -Leave a comment telling me which item from the shop is your favorite. Don't forget to include your e-mail address in the comment so I can contact you if you win! As if that wasn't enough, everyone also gets a 20% discount at Beta Boutique by using the code VeryImportantPerson at checkout. i'm following your blog via google friend connect and bloglovin and i'm following beta's blog too. my favourite item from the shop is the "Vintage tomboy style black classy OXFORD ANKLE Booties" (http://www.etsy.com/listing/64327291/vintage-tomboy-style-black-classy-oxford) but once it won't fit me, if i win i'd pick the "Vintage Casual blue Denim working class hero cuffed Shorts" (http://www.etsy.com/listing/63833887/vintage-casual-blue-denim-working-class). Ik volg zowel jou als Meta natuurlijk, en van haar boetiekje roept de 'skyblue and white plaid dress' toch wel heel hard mijn naam, voor op de dagen dat ik me als Dorothy van de wizard of Oz wil voelen..
following you both with google! Vintage 70s Countryside pink and white Floral cotton dress! I really like the striped schoolgirl mini dress. It's so cute! Thanks for this giveaway! I was already following you via GFC and Bloglovin. Now I'm also following Vibtage Beta! My favourite item from the shop is the Vintage 1970s handmade tooled Buffalo leather Purse. Follow yours and Beta's blog via Google Friend Connect. My favourite item would be the Vintage ROMANTIC SILKY paisley textured light blush pink pleated MINI dress, size Small to Medium, S / M. Love the pleated skirt and paisley print. It's absolutely lovely! Amazing Giveaway! Keep your fingers crossed. Wat een fijne shop! Moeilijk kiezen... Ik zou gaan voor de 'Vintage 1970s turquoise and white Tulip pattern Day Dress'. De kleuren, de riem: cute!!! ah leuke give-away, ze hebben eigen teveel leuke dingen om te kiezen haha. I'm following Beta's blog and added you via Google Friend Connect. My favorite item is the Vintage 1970s Novelity Print purple button up midi skirt. Love the really cool print. Thanks for the giveaway! Wow, if it hadn't been for this collaboration, I wouldn't even know about Beta Boutique! They have such cute pieces, so it was really hard to pick a favourite! But I finally did - it was "Vintage NAVY blue FLORAL summer MINI DRESS with SAILOR collar" (http://www.etsy.com/listing/44824221/vintage-navy-blue-floral-summer-mini) that won my heart! Thank you for this giveaway! I'm following both your blogs, and favourite item is the Vintage cafe au lait cotton Yoke Puffed skirt, not a colour I'd usually wear but this skirt is beautiful! Did everything you said! My email is tedd@walla.com. My fave item is definitely the Recycled Emerald Green sparkly Party mini skirt. My favourite colour is Emerald, and this skirt is just beautiful. Follow you both and love the Vintage 1960s navy and white polka dot Halter Dress, Medium. I follow both blogs on Google Friend Connect. The Vintage 70s Cherry red gauze Countryside Tent dress is one of my favourites! Thanks for hosting the giveaway!